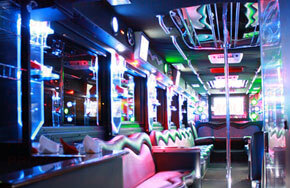 Get the party started with a Fort Myers party bus rental. 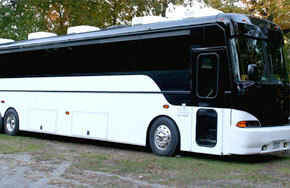 Our Fort Myers party bus service can transport your large sized group to anywhere in the state of Florida. Imagine partying with all your friends, family, or colleagues in a spacious and luxurious party bus filled with amenities (large screen TV, sound system, CD and DVD players, iPod connectivity, leather seating, dance poles, satellite TV, lavatories, fiber optic lighting, multiple wet bars, and more). Why cram your group into an overcrowded limousine when you can fit everyone comfortably in a generously sized Fort Myers party bus? 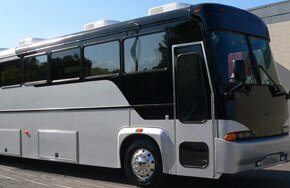 Nobody has a larger selection of party buses in Fort Myers Florida! 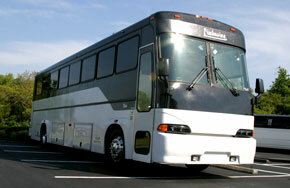 We are committed to bringing you high quality, luxurious, and safe party bus service. 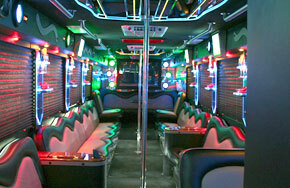 We are the Party Bus experts; get ready for the time of your life. While your group parties like rock stars, we will get you around town safely and reliably. When you have this party machine you don’t need to go to the nightclub anymore. You can party while you’re cruising! This is the ideal vehicle for that legendary bachelor, birthday, corporate, or prom party you’ve been waiting to have. The only limitation is your imagination. Contact us now for a free quote or to setup a reservation. Call 239-288-0558 or click on our Live Web Chat.